Dry Eye Syndrome or Dry Eye is a catch-all term used to describe an abnormality with the tears of the eyes. Dry eye doesn’t necessarily mean your eyes are arid. In fact, many people with dry eye have watery eyes. Dry eye means there is a problem with the tear film of the eyes. Dry eye can be extremely painful and uncomfortable with burning, stinging, aching and itching along with sensitivity to light, dryness, redness and blurry vision. Chronic dry eye can place significant limitations on your daily life both physically and mentally that prevent you from doing the things you want to do. The tear film covering the surface of the eyes is made up of different layers. There is a watery (aqueous) middle layer, an oily (lipid) outer layer and a mucin (mucus) inner layer. Normal and properly balanced layers of the tear film are essential for eye health, clear vision and comfort. If an abnormality arises within any layer of the tear film, the tear film may not function properly and the symptoms of dry eye develop. Meibomian Gland Dysfunction or MGD is a leading cause of dry eyes. In fact, a majority of dry eye suffers have MGD. With MGD, there is a reduction in the supply of oil or an abnormal composition of the oil produced by the Meibomian Glands. These glands are located in the upper and lower eyelids. The oils produced by Meibomian Glands are used in the lipid (outer) layer of the tear film and prevent tears from evaporating too quickly. When the Meibomian Glands aren’t delivering the quantity or quality of oil needed in the lipid layer, dry eye will typically follow. As we age, our bodies go through many changes. One of these changes is the natural decline in tear production. As a result, dry eye is a common complaint of senior adults. 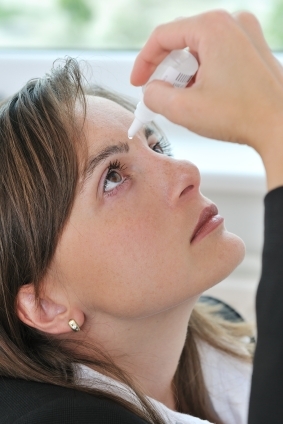 While not a specific cause of dry eye, your environment can magnify the affects of dry eye. Wind, heat, air conditioning and exposure to chlorine from swimming pools or showering all exaggerate and heighten the symptoms of dry eye. Extended time reading or using a computer can also aggravate dry eye symptoms. Antihistamines: Help to reduce allergies but studies have shown they can also decrease tear production. Antidepressants: Are known to cause ocular or eye-related drying. Sleeping Pills: Both over the counter and prescription sleep aids may cause side of effects of dizziness, confusion, dry mouth and dry eyes. Birth Control Pills: Birth control medications stimulate hormonal changes which may lead to dry eye symptoms. Diuretics: Commonly used medications for treatment of high blood pressure may cause dry eye. Isotretinion Medications: Used to treat acne conditions but may also cause dry eye. While there is no specific cure for dry eye, it’s very important to discuss this condition with your eye doctor so he or she can properly diagnose the type of dry eye and develop the appropriate plan and guidance for you. There are a variety of treatments your eye doctor may utilize for dry eye symptoms including, but not limited to, artificial tear drops, lubricating gels, medications and plugs. To learn more about quality eye care and eye wear, please visit www.shawneeoptical.com.